I often wonder what road we’re heading down, Australia and the rest of Western civilisation. No other society on Earth has enjoyed the levels of freedom, happiness and prosperity that we in the West enjoy, yet our grasp on this position of untold fortune seems to be slipping. There is the economic decay that we are witnessing, but there is also the erosion of the values to which we hold so dear. Central to the idea of Western culture is freedom of speech. It amazes me how much this has been taken for granted and so easily discarded by some in Australia today. With laws against hate speech, defined by the subjective insights of others and the prospect of a news media council, with Britain too facing similar infringements on media freedom, it is clear to me that we have forgotten the ideals and the history that got us to where we are today. Topher, in his long-awaited video, explains the importance of free speech and exposes the elitist nature of those who seek to take it. Tell that to the Chinese farmers who were forced from their land because those in power thought a dam was more important than private property rights. Tell that to the newborns killed because they put their parents in breach of the one-child policy. Tell that to the dissidents who are imprisoned and even killed for standing up to their government. Tell that to the miners who suffered long and agonising deaths underground in this ‘worker’s paradise’. Tell that to this champion of freedom, where ever he is. Yes, democracy is superior to an autocratic, totalitarian, communist state. Rowan Callick is absolutely right in identifying the culprit for this attitude. Chalk it up as a win for the relativism that rules our schools and universities – the perspective that all points of view are equally valid, that it is unhealthy to show preference for any one system of government, and that truth is relative and essentially unattainable. We see those in power lament the tactics of their opponents, seemingly without the understanding that this is the point of democracy. The ALP accuses the Coalition of delaying progress with regards to the carbon tax, and decries their “destructive negativity”. Of course, the definition of progress differs between people. That is why proper parliamentary process is so important, to ensure that any change is desired by most in the population, and fits their view of progress. The Coalition is merely representing the position of most Australians, as they should in a democratic system. In the US, the Democrats accuse the Tea Party of being similarly obstructive with regards to Obamacare. Yet, in order to meet our Kyoto agreements, we witnessed what was essentially the theft of private property, because the government thought it had a better use for the land than the landowner. I’ve been talking a lot of doom and gloom, but despite this, I still consider myself an optimist (I still think Geelong will win the flag this year). However, an economic turnaround will not be enough. We need to rediscover the values that made the West great in the first place. We need to rediscover our taste for freedom. 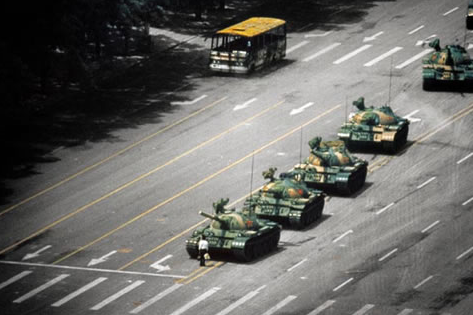 By coincidence, this is the 23rd anniversary of that photo. 1 Response to What does the future hold?